"The distinctive guitarist is helping define post-millennial jazz." "At once highly controlled and recklessly inventive"
"This guys worth listening to through a ten dollar pocket radio." 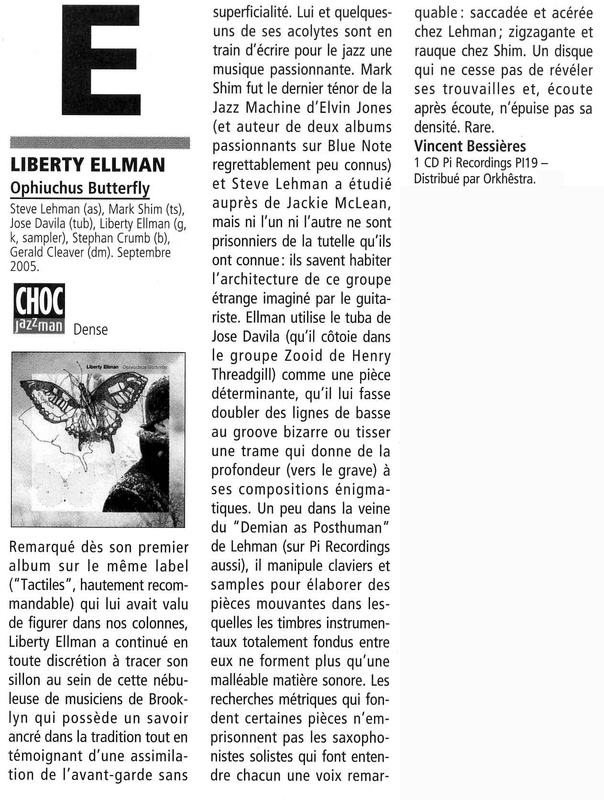 "Ophiuchus Butterfly boasts a bottom end carried in large part by a tuba, with Ellman's spare, subtle and sparkling guitar parts bubbling throughout". The whole mix is enchanting, sounding futuristic at times, without ever sacrificing the organic core hinted at in the scientific song titles." 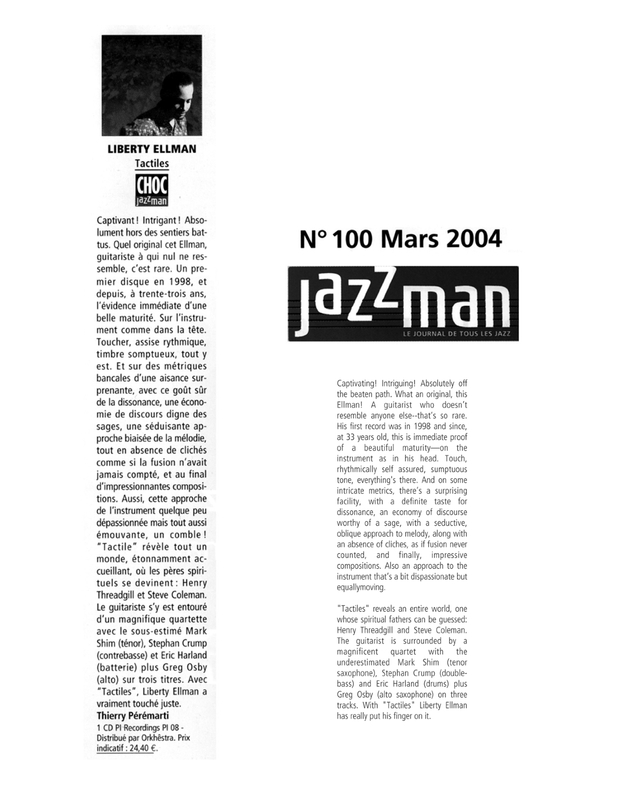 "Ellman's music is quite original and subtle." "his touch and vision are omnipresent: in the album's stuttering funk, its electronic interludes, and its general tone, which is jagged but somehow delicate, like eggshells in a careful pile." "It's never chaotic, but never predictable, and always compelling." "... absorbing, challenging music from a guitarist who, like his peers Jeff Parker and Ben Monder, is keen on avoiding cliche. Definitely a name to watch." 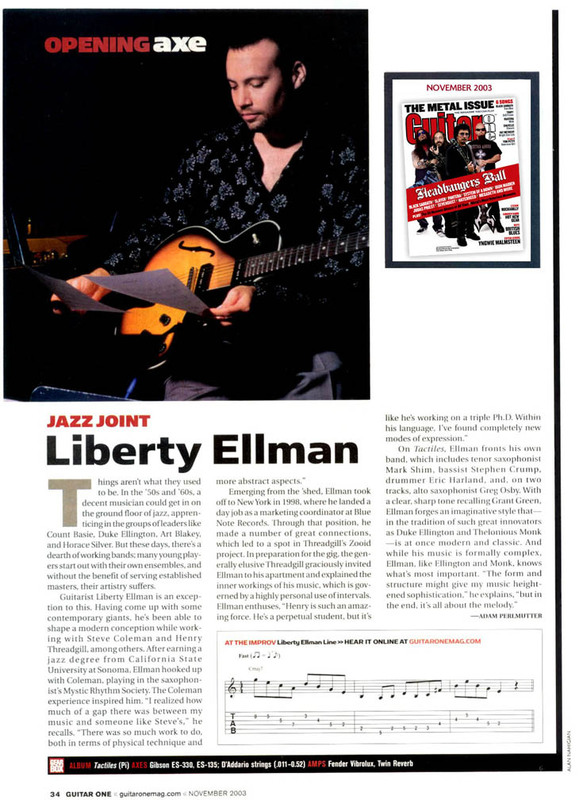 "With his new CD 'Tactiles' Liberty Ellman emerges as one of the most intriguing, albeit unorthodox, guitarists on the New York scene today. An album of original, esoteric compositions marked by dense polyrhythms, dissonant, angular lines and an organic logic that ties the whole thing together in brilliant fashion..."
"With a clear, sharp tone recalling Grant Green, Ellman forges an imaginative style that--in the tradition of such great innovators as Duke Ellington and Thelonious Monk--is at once modern and classic." 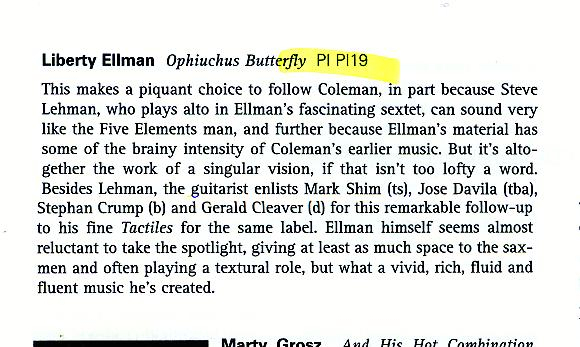 "A guitarist cut from neither of the cookie cutters that produced legions of note-happy virtuosos and techno-geek fusioneers, Ellman shows his stuff as player and composer on a new CD with Greg Osby and Mark Shim that could make a lot of year-end lists." 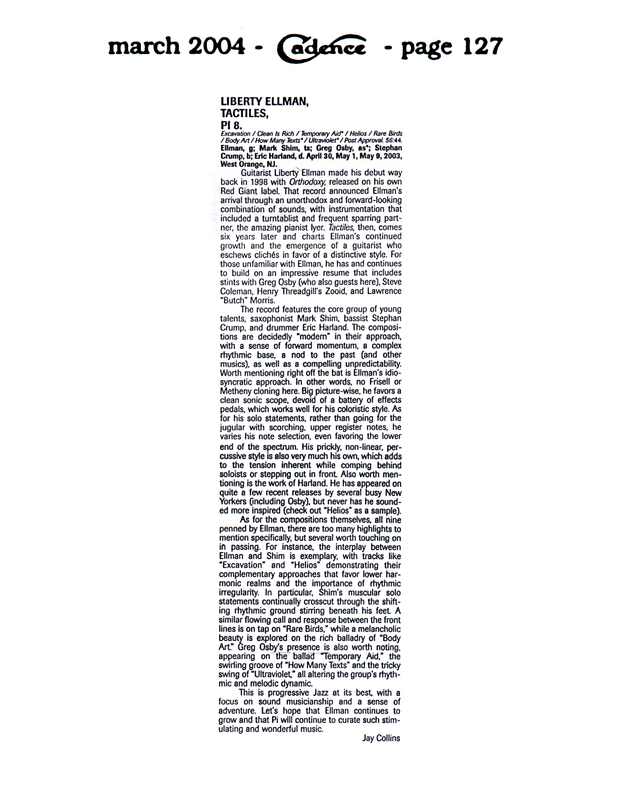 "Guitarist Liberty Ellman is much enamored of intricate melodies, and it shows on his satisfying new disc, 'Tactiles.' His compositions are snaky without being impenetrable, which is why his quartet sounds so relaxed and traditional even as it tackles rhythms and soundscapes that move well beyond swing."